At Simatai the Great Wall of China goes up from a valley in both directions, then winds around a steep moutainside. 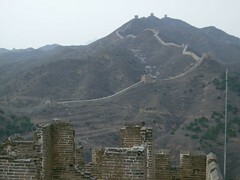 Incredibly this wall was begun over 2000 years ago, though I think most parts were completed during the Ming Dynasty which ruled China for about 300 years – from 1368 to 1644. The Ming were the last of the Han and were deposed by the Qing Dynasty who ruled until the Nationalists kicked their butts in 1911. This entry was posted in Beijing, china, not yet categorized, tourism, travel. Bookmark the permalink. The Great Wall is something to behold. Did you trek it? Great mini-history lesson and photograph.